Why Legions of People Wonder: Do You Feel Like I Do? There’s a deep, draining feeling that many people carry through every single day of their adult lives. But few are consciously aware of this feeling, or ever actually put into words. So please allow me to do it for you, using the words I have heard many people use to describe it. This is a feeling that saps your energy and your joy. It lurks in the background, making it hard for you to believe that you fit in anywhere, or that you are okay. This feeling colors your world gray and holds you back from many of the most rewarding parts of life. When you live with this feeling you are most likely not fully aware that you have it, yet it drags on you and weighs on you day after day. This feeling can become such a constant in your everyday life that you experience it not as a feeling, but as a fact of life. Woven into the fabric of your existence, you naturally assume it’s a basic part of the human condition. Doesn’t everyone feel like I do? Until one day you look around, and you see that other people seem more comfortable in their own skin. Other people seem to feel that they belong. Other people seem to be living lives filled with passion and joy and heartbreak and hurt that you, in some inexplicable way, for some unfathomable reason, seem unable to fully experience. “What do all these people have that I lack?” you wonder. Why do they seem to be so connected, so comfortable, so driven, so fulfilled? Why do I seldom feel like I belong? Why am I living on the outside? What makes me different from everyone else? Believe it or not, when you ask these questions, it’s actually a good sign. It means that you have finally moved beyond your lifelong assumption that everyone feels this way. You have progressed forward and reached a realization. Everyone does not feel like I do. I am missing out on something important. Something that truly matters. Now some good news. Keep reading and you will find that you can overcome this feeling. You don’t have to live with it anymore. But first, let’s talk more about what caused it in the first place, and also what it means. 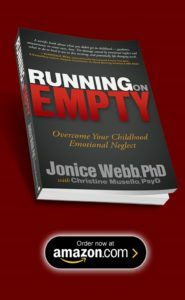 Childhood Emotional Neglect is, unfortunately, a common childhood experience. It takes place in many unsuspecting homes and is perpetrated by many unaware adults. It’s often invisible, usually unmemorable, but yet it leaves an enduring mark upon the child. Childhood Emotional Neglect happens when your parents fail to notice your feelings enough and respond to them. So it’s not exactly something that happens to you as a child; it’s more like something that fails to happen for you as a child. Your emotions and feelings and emotional needs go unnoticed, unvalidated, and essentially ignored. This was the experience that caused the feeling that you live with now. 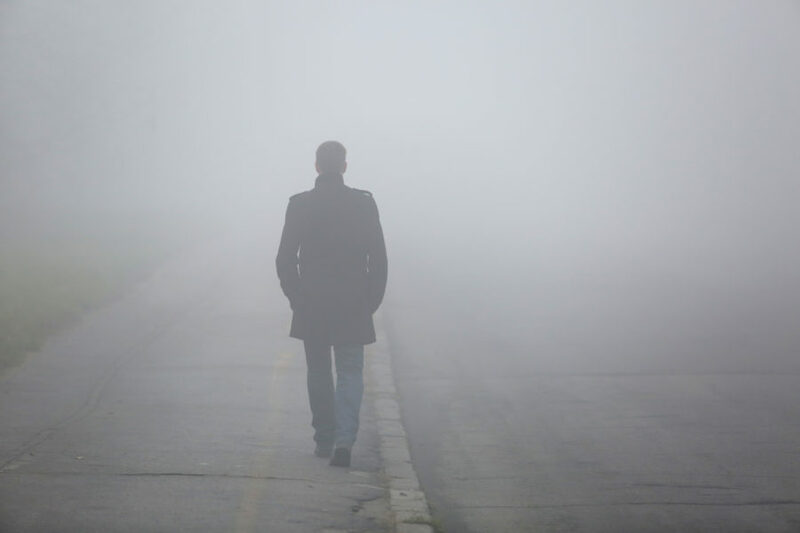 When you grow up with Childhood Emotional Neglect, you learn that your emotions are a useless burden, and you continue to treat your own feelings in exactly that way as you move forward in your life. Going forward, whenever you have a feeling, you either question it or doubt it or minimize or reject it. You assume that your feeling is wrong, or selfish or excessive or useless so you override it or ignore it or both. Every time you do this to one of your emotions, you are doing it to yourself. You are pushing the most deeply personal, biological expression of who you are down, and away. In doing so, you are minimizing and marginalizing yourself. You are making yourself an incomplete version of yourself. You are squelching yourself. What does this feeling mean? It means that you are continuing to neglect yourself. How Can You Get What Other People Have? In a way, the answer to this question is remarkably logical. To get what other people have, you must reverse the process of the Childhood Emotional Neglect you grew up with. You can start by absorbing and embracing the Emotion Facts below. Your emotions are wired into your biology. Since you cannot choose them, you cannot judge them as wrong, excessive or bad. They are what they are and you must accept them. Every feeling is a message from your body. It’s important to pay attention and listen to their message. Emotions are useful sources of energy, connection, motivation, passion, and purpose. The more you embrace your feelings, the more you will have all those things. Even though every feeling is important, that does not mean every feeling should be indulged. There are ways to manage your feelings, and many feelings can, and should, be managed. Never judge yourself for having a feeling. It is what you do with your feelings that matter. Once you understand and accept the 5 Emotion Facts above, you can make a vow to yourself that you will stop the pattern set up for you in childhood. And then you can fulfill that vow by treating yourself in a different way. So when that inner voice says, “It does not matter what you feel,” you do not accept it; you talk back. “It does matter what I feel,” you insist. “I will accept and pay attention to this feeling. I will listen to its message, I will take responsibility for it. I will manage it or, if needed, share it. I will own it as the deepest expression of myself. My solemn vow to myself: I will not hide anymore. 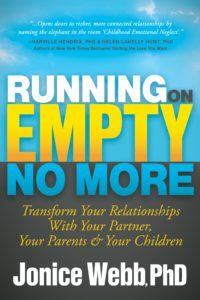 To learn much more about how Childhood Emotional Neglect keeps you feeling disconnected from the most important people in your life, see the book Running On Empty No More: Transform Your Relationships With Your Partner, Your Parents & Your Children. 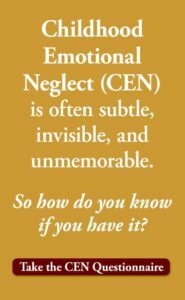 Childhood Emotional Neglect can be subtle and unmemorable so it can be difficult to know if you have it. To find out Take The Emotional Neglect Test. It’s free. Could you give an example of how one ignores one’s feelings and emotions and how one should respond to them? Hi Leticia, this blog is full of examples like that. Just keep reading and you’ll find many. Thanks Janice Found this Helpful signed up for your free videos and found this article helpful. Yes I have felt on the outside and wanting a place to belong so I echo what you said there. I read your article on parents with CEN and I think it’s true it generational. Looking to get up with a local therapist as per your email who as done one or more of your CEN training. Thanks for your sharing research and input. So helpful. Sometimes I feel like I am doing so well and then I go to a public event and suddenly feel so out of place and conspicuous and like people can see I shouldn’t be there. Is that not paranoia? Could it be both? This has been the hardest aspect for me: always feeling like I’m on the outside looking in. This leads me to striving, and now finally acknowledging and realizing this is my tendency (people pleasing at its best) makes me accept myself more and feel much more comfortable in social situations. I’ve striven towards perfection in the hope of being ‘in’ but now I see I’m in with myself – and that’s the best! Since I’ve realized this aspect of myself, I’m amazed at how relaxed I am. The fact that I can accept myself fully, flaws and all, and even in seemingly highly stressful situations – it’s a worldview shift for me. All these great articles keep coming. They are such a big help. Thank you from the bottom of my heart. opening up this important information. Thank you. Don’t know if my experience of love has anything to do with CEN but I’d like to share it with anybody who will listen. I have fallen in love many times but ALWAYS with the wrong type of man who would eventually maltreat me. Several kind-hearted, genuine men have fallen in love with me but I found them to be somehow silly and not worth listening to. Result – I am now 66 and totally alone. Lonely too, although luckily for me I have my studies which I love. Is there anyone out there who can relate to what I have said please ? I have always felt that I was in some way a horrible person !!! I can relate, Dr. Lawson! I’m 53 and have a track record of failed relationships behind me, and the pattern is clear in hindsight. I did just what you’re describing: I was drawn to the type of man who would not treat me well. In some cases, it was downright abusive. Yet, there were always kind and honest men who were available and interested in knowing me, in caring about me. But nope, I continued to break their hearts and end up with selfish a-holes. As a result, I am single by choice these days, lonely often. But I am learning to hope that I will figure out how to have some type of intimate relationship eventually. I don’t want to hurt anyone like that again, for one thing. I also want to allow myself to experience this thing people refer to as “love”. 🙂 We are not horrible people, only confused about our own value. Ai yi yi, I’ve called myself “Jane Goodall” for years, watching people interact, assuming they also feel as if they are Jane Goodall watching a separate species … and I know that CEN is a huge part of me now. You articles have really opened my eyes — your two most recent especially. I can’t tell if it’s because there is anything unique about them or simply because I’ve become ready to listen to what they have to say, but I’ll take it. Dear Richard, I understand the term “martian man” and I do believe you will find the tools here. You are on the right path!